A few weeks ago our clients threw a party at the chalet. 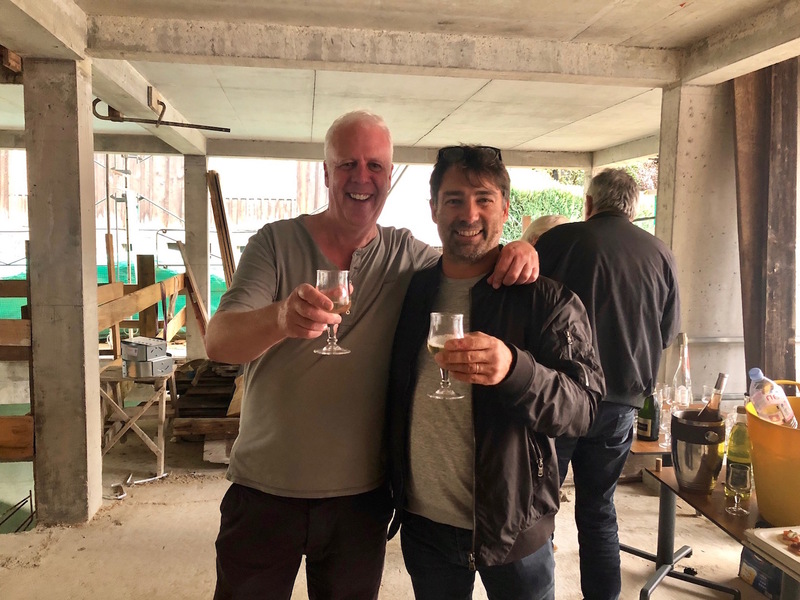 Given that the building is currently a construction site (you can see the progress of the build in the work in progress section of our website) this may seem surprising, but the soirée was actually part of a tradition that is locally celebrated and called La Lève. 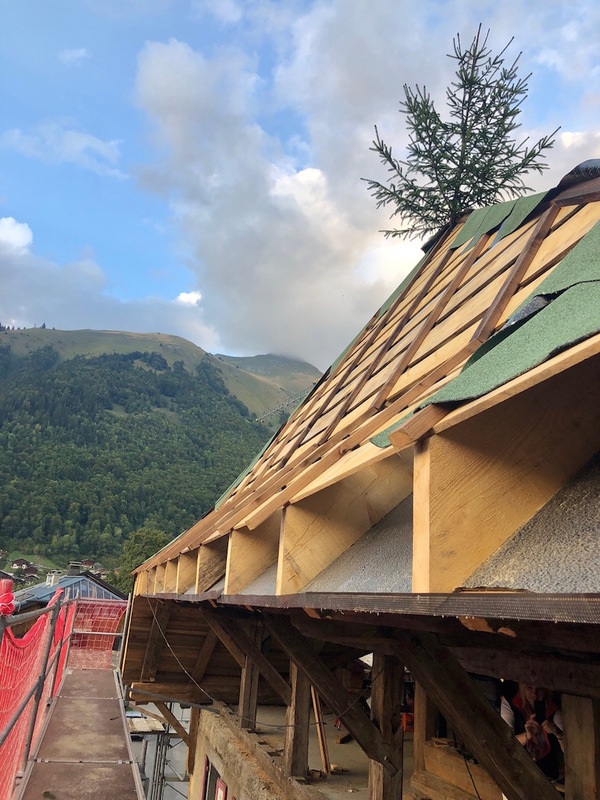 There is no direct translation to this in English, we may refer to it as a “topping out” event – when the roof is on the structure – but locally this is a key point in the chalet build. Traditionally, new properties were built by the villagers from local resources (stone and wood with a slate roof). After a period of constructing the wooden frame of the building on the ground, there came a moment to hoist the frame into place. At this juncture the whole community would be required to assist in this difficult task – to “lève” the structure. As a thank-you to the village there would be a party to celebrate, and it is this moment that we commemorated a few weeks ago. For the event, the chalet also displayed another local tradition – a pine tree strapped to the top apex of the roof. Many new-build chalets in our region are thus adorned to celebrate the roof being fitted to the property. This is also an ancient tradition, dating back to the Dark Ages and it is a pagan rite designed to appease the tree-dwelling spirits of their displaced ancestors. Feeling suitably protected against grumpy sprites we celebrated in style! La Maison is a magnificent property. Situated in the very centre of the pretty Alpine village of Montriond, between the Mairie and the church, it is an iconic local building. Having been derelict for a number of years, our clients purchased it with the aim of restoring the property – retaining the charm and character of the building together with its historic façade – whilst creating a luxury 6 bedroom property complete with swimming pool, gym and spa. Together with Marullaz Architectures we have been working on the designs for the property for the last 2 years, and are now excited to see the renovation slowly taking shape. After excellent progress over the summer on the wooden structure and roof of the house, aided by wonderful weather, the evening event was a welcome opportunity for all of the trades to relax with some fabulous food and wine and really appreciate the transformation to date. 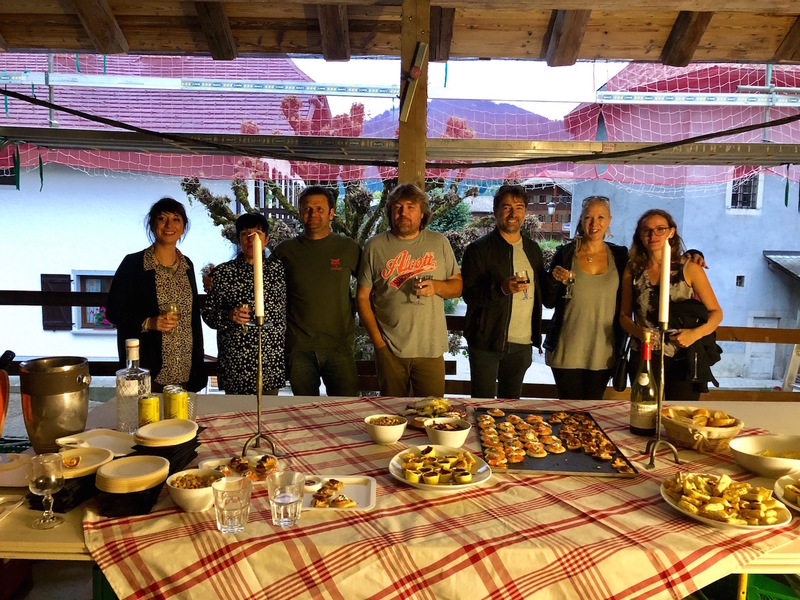 The clients asked the local bar La Marmotte d’Or to provide the catering for the event, and so the trades were treated to one of the most sumptuous spreads I have ever seen at a lève – amazing canapés together with champagne, wine and beer. Chapeau La Marmotte! 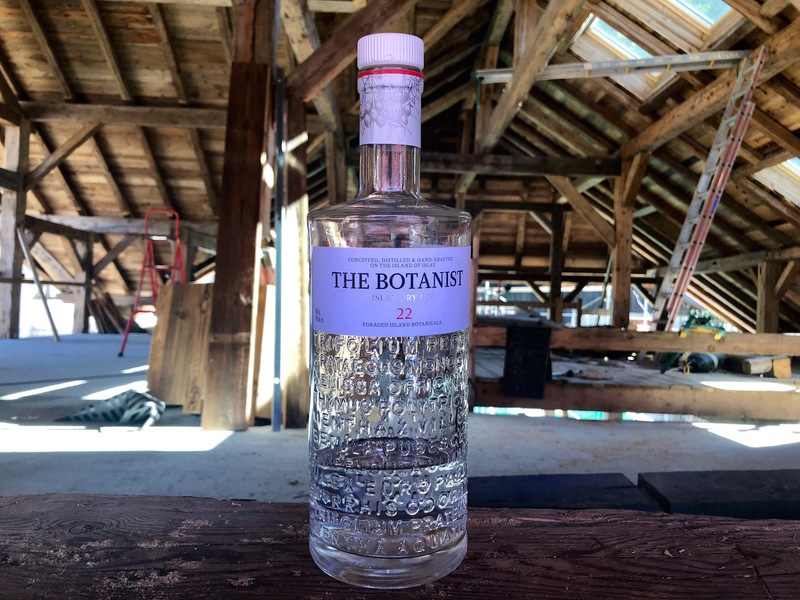 We were also treated to fabulous gin and tonics using the legendary Botanist gin – courtesy of our Scottish clients. Kyles was particularly grateful as she was gifted the rest of the bottle at the end of the evening….. alas it did not last long in our household!! So now we are back to work on the design details of this exceptional property – electrics layouts, finishes plans and bathroom designs. We are due to complete the project in time for the Winter 2019/20 season, and believe that this will be one of the premier properties in the region, as it will combine heritage and alpine charm with luxurious facilities. It is a project we are privileged and delighted to be undertaking.